This short original setting of the Adoramus Te text allows choirs to develop tone quality, blend and expressiveness through homophonic harmonies and legato phrasing with occasional dissonances and suspensions. An excellent a cappella selection for contest! Here is a popular Zulu traditional song as arranged by Rudolf de Beer, former conductor of the Drakensbeg Boys Choir of South Africa. What a vivid connection to the people and culture of that part of the world! Authentic percussion and movement suggestions give this selection great visual appeal. This work for unaccompanied mixed voices and two soloists is a setting of a traditional Holocaust melody for a moving tribute to those who perished. A powerful and dramatic selection for remembrance and memorial concerts as well as other occasions. This rich setting of the Ave Maria text captures the essence of sincerity and transformation through the progression of harmonies. The thrilling cluster chords epitomize the challenging moments in life as they relax into the simplicity of open consonance. A stunning work for capable mixed choirs from high school and up! Lovely warm harmonies will fill your performance space with this short setting of the traditional Irish blessing. A few slight lyric alterations provide a more enveloping framework for the listener and offer hope for a future meeting. Ideal for both secular and sacred programming. Invigorating vocal percussion and layered harmonies bring life and energy to this Brazilian children's song that will be an excellent world music addition to concerts in middle school and up. In Portuguese with background information, translation and pronunciation. This Bolivian folksong is alive with rhythm and movement! Body and vocal percussion give this a cappella setting intensity and drive - a wonderful showcase for mixed choruses in school and community! This a cappella setting of the traditional American folk hymn creates a wonderfully expressive atmosphere for treble voices that is ideal for developing phrasing, intonation and sight-reading skills. A great selection for contest and festival performance! Duration: ca. 2:25. This Celtic blessing is well-known and loved in many different versions and this setting will be especially effective as a gentle closing number or encore for school and community choirs. Easily-learned, it offers opportunities to teach flowing lines, diction and dynamic contrast. Feature a special soloist with this tour de force a cappella setting of the 1963 #1 hit by Manfred Mann and bring down the house! An awesome closer or encore! Syncopation and body percussion combine to capture the excitement of this original piece and highlight the overall feel of the Flamenco style. A wonderful and unique showcase for mixed choirs from high school and up! 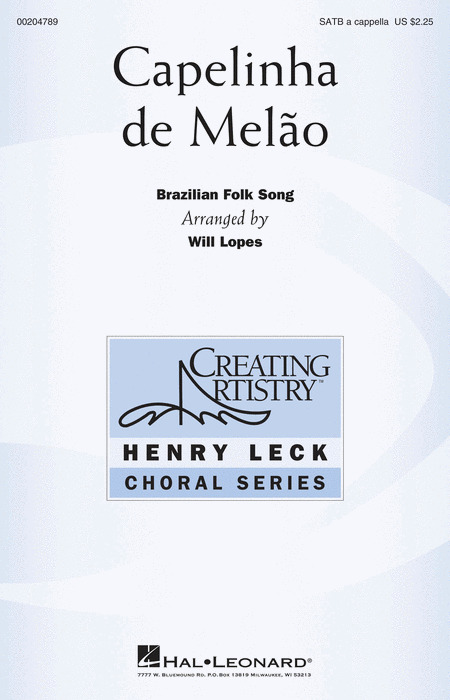 From Anders Nyberg's collection of South African folk songs, this a cappella setting by Henry Leck is quite simple, yet very powerful. It's a popular choice for festivals and combined choir events. Available: SAB a cappella, 3-Part Treble a cappella. From Anders Nyberg's collection of South African folk songs, this a cappella setting by Henry Leck is quite simple, yet very powerful. It's a popular choice for festivals and combined choir events. Ken Berg : Good News! A soloist with choral backup, bright percussive rhythms, a bluesy vocal bass line and the visual appeal of body percussion make this energetic spiritual setting a first-rate showcase for mixed or treble choirs! Available separately: SATB, SSAA. Duration: ca. 2:30. Now available in a treble voicing, this energetic spiritual features a soloist with choral backup, bright percussive rhythms, a bluesy vocal bass line and the visual appeal of body percussion making this a first-rate showcase for mixed or treble choirs! This popular worship song from Kenya can be performed in a variety of ways, by adding movement while singing, incorporating percussion instruments into the performance, or as a processional. Opening with a simple unison melody, the song progresses into two parts and finally adds a descant-like 3rd voice part. Now available in a mixed voicing, this popular worship song from Kenya can be performed in a variety of ways, by adding movement while singing, incorporating percussion instruments into the performance, or as a processional. After a brief polyphonic introduction by the women, this favorite African-American spiritual moves into a homophonic setting featuring long legato lines, controlled dynamics, all with a focus of creating drama through this powerful text. This bright, up-tempo spiritual rejoices in what awaits us in heaven (beautiful robes, new shoes, golden harps) and also pokes humorously at those who just may not be allowed through the pearly gates - everybody talkin' 'bout heaven ain't goin' there. Vibrant, syncopated rhythms and the lively melody provide ample opportunities for an interesting and expressive concert showcase! Set to the majestic This is the day that the Lord hath made psalm text, this highly flexible a cappella work is especially good for a multi-choir festival or concert. Short and accessible, the work opens antiphonally with fanfare-like phrases, moving to a more subdued contrasting section before returning to the opening music for an uplifting conclusion. This sparkling setting of the traditional French carol will show your treble choir at its best! Includes an optional finger cymbal and drum part. A French pronunciation guide available on the VoiceTrax CD. Performance Time: Approx. 2:15. Available separately: 3-Part Treble div. a cappella and VoiceTrax CD. Here is the traditional spiritual in a contemporary and dramatic setting for women's unaccompanied voices, opening with a beginning unison melody, performed in a slow, heavy manner. When the tempo picks up, the melody is supported by the other voices and a recurring rhythmic groove that adds to the urgency of the text. This setting of the traditional African American Christmas spiritual features a baritone soloist supported by unaccompanied mixed voices. Varying in tone color, dynamic contrast and texture from verse to verse, this selection will enhance Christmas programming in school, community and church! Here is a popular South African traditional song as arranged by Rudolf de Beer, former conductor of the Drakensberg Boys Choir of South Africa. What a vivid connection to the people and culture of that part of the world! Includes percussion and pronunciation guide. This traditional greeting/salutation song of the Kwangali and Sotho people, with authentic call and response vocals, djembe, bass drum and shakers will be easily learned and a singer and audience favorite! Accessible for young choirs, this piece makes fun of common tourist phrases in Swahili, so don't look for a deep meaning in the text! A rhythmic pulse provides lots of fun for the singers and creates an exciting performance! Duration: ca. 3:15. This rich setting of the Latin Eucharistic hymn offers an expression of devotion through rich harmonies and a treble obbligato. A stunning work for capable mixed choirs from high school and up! This setting of a Latin hymn text for unaccompanied treble voices is a fervent and expressive outpouring of devotion. 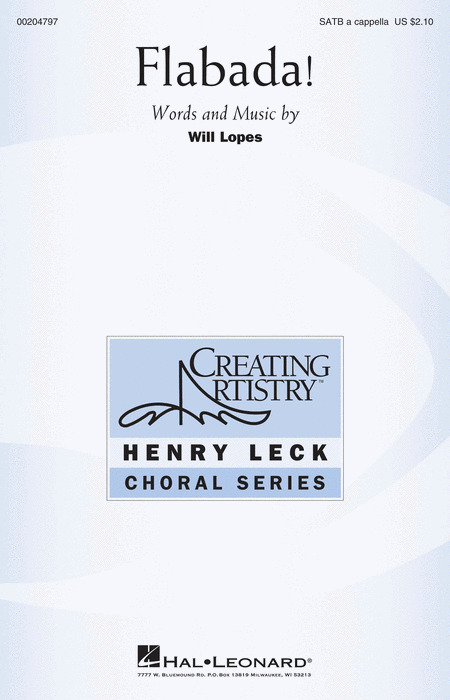 Ideal for treble choirs in school and community for contest, festival and sacred concerts. Robert Townsend : Oh! What a Beautiful City! This spiritual setting is ideal for honor choirs, festivals and advanced groups from high school and up. It is highlighted by rich syncopated and polyrhythmic sections, and the use of divisi male chorus is reminiscent of quartet singing. Thrilling! From a serene and ethereal opening, this traditional spiritual transitions into an energetic gospel refrain, with call and response lines and exciting vocal effects. An outstanding treble showcase! With piano or optional a cappella. The opening of this popular spiritual is presented in the traditional a cappella style, but before long it kicks into a fun and funky gospel groove that presents the melody punctuated by insertions of the word trouble! along with characteristic scoops and other vocal effects in a celebratory outpouring of spirit. Written as an homage to ancestors both slave and free, this two song collection (1. Git Outta My Way & 2. Sacrifices of Righteousness) explores both the European-influenced spiritual style and the gospel-spiritual style. Each of these calls on the singers to explore different singing styles and acts as a wonderful teaching tool both historically and musically. The Grammy-winning singer Kelly Clarkson scored big with an elegant, pitch-perfect and rousing rendition of "The Star-Spangled Banner" at Super Bowl XLVI with choral back-up provided by the Indianapolis Children's Choir, conducted by Henry Leck. Here is the arrangement in two keys, the original in G, as sung by Kelly and a B-flat edition, for use with soprano or tenor soloist, or a group of singers. Recorded by the Indianapolis Children's Choir, Rachel Anderson, soloist. Don't be afraid to let your true colors show! A message that all of us need to hear. This iconic song by pop/rock legend Cyndi Lauper is timeless. This new arrangement relies on the strong heritage of the original while bringing new sensitivities that reflect the times we live in. Here is an original celebratory piece in Swahili based on Romans 8:31, carrying the message that we can move forward in life because we know that God is on our side. With solid harmonies, a steady groove, optional choreography and percussion, this piece will enhance programs in school, community and church choirs. This South African folksong will add a simple yet colorful flavor to any concert program with a tongue-in-cheek teasing of a special girl who likes to show off! Easily-learned with primary triads and layered vocal lines, you can accompany with shaker and djembe. This a cappella arrangement of the traditional spiritual pulses with rhythmic energy in this setting for mixed voices and baritone soloist. Vivid contrasts, layered vocal phrases and varied textures make this a superb showcase for choirs in church, school and community. I will meet you when the roses come again - these nostalgic words form the touching refrain of this a cappella setting for male voices. 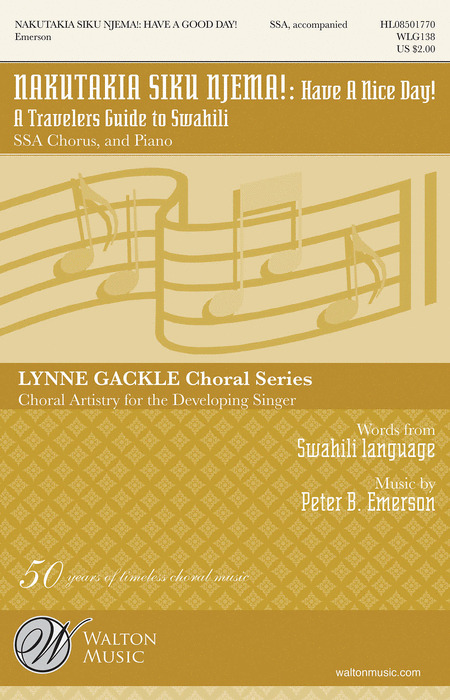 Offering many opportunities for developing style, intonation and expression, this is an ideal selection for developing choirs in middle and high school.